A pair of weirdo comediennes, dressed in golden-zippered white, film themselves dancing a modernist paean to self-confidence, only to be upstaged by a fluffy pomeranian in a tracksuit. An elite spy goes off-mission to set a trap for the enemy that has compromised her best friend. A teen inventor uses her giant family’s leftover junk to build a backyard snow machine, a giant electromagnet to attract lost keys and coins and toys, and a homemade VR headset. Two best friends and single moms—one of whom is psychic—move in together to share rent and blend families. A girl welcomes her punk rock older sister home, only to find out her sister is actually her mom, and the woman she thought was her mom is her grandma. Rapunzel’s magic adventurer’s hair grows back. Kids’ television has been a hothouse for stories featuring empowering, badass girls for ages (Shout Out to the Bad Bs of the 90s), but when it comes to pure Bechdel-busting saturation, Disney Channel has spent the last decade and a half proving itself the network to beat. From Lizzie McGuire to Kim Possible to That’s So Raven to Hannah Montana to The Wizards of Waverly Place to Girl Meets World to the Dream Big, Princess empowerment campaign (and every Liv and Maddie and Sonny in between), Disney Channel has been normalizing oddball girl power uninterrupted since 2001. It is no wonder, then, that with girl-centered stories so firmly second nature, Disney has had the storytelling energy to move on this year to even more advanced levels of family-friendly representation: that of class (begun in earnest with Maya on Girl Meets World but continued on Stuck in the Middle and Andi Mack); race (all current shows save the animated series and the usually Bechdel-failing Bunk’d star non-white leads); nontraditional families (on both Raven’s Home and Andi Mack); and—with Cyrus’s quiet coming out moment in the Season Two premiere of Andi Mack earlier this month—sexual orientation. Disney Channel, in short, has stealthily become the best network on which to raise the next ready-to-be-woke generation. 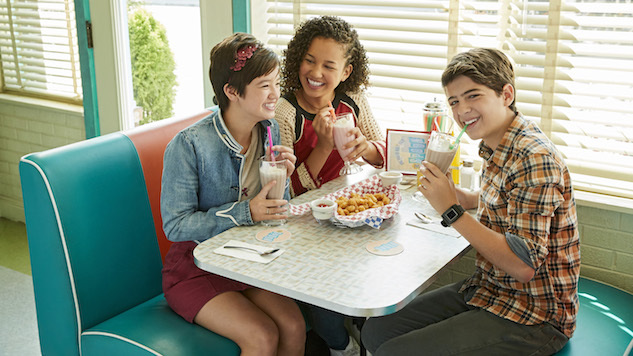 The star of the Disney lineup right now is Andi Mack (Peyton Elizabeth Lee), a biracial 13-year-old whose biggest concerns were where to source recycled materials for her found-object jewelry, how to ride her new electric bike without crashing into her friends, and whether or not she would ever work up the courage to talk to the ultimate frisbee player she has a crush on. And then her cool older sister Bex (Lilan Bowden) rolls into town, and by the end of the day, Andi has learned that Bex is actually her real mom, and her real dad is (as yet) a mystery. The drama that follows shifts focus to this revelation and its fallout—Bex and her mother (Lauren Tom) have heavy baggage to work through on top of everything else—but doesn’t pretend that Andi would stop caring about her art projects or friends or crush. It also doesn’t ignore her friends, Buffy (Sofia Wylie) and Cyrus (Joshua Rush), who each have their own goals and obstacles that, in Season Two, are only growing more significant. Every show on Disney echoes some genre of “adult” show; this is the one that tracks most closely to something like Parenthood or This is Us. It has light moments, but its goal is to give the audience DRAMA to attach to—it even has a “Talking Mack” after show, featuring a half dozen girls and boys who recap the episode, decompress, and make predictions for the future. The mildness of the drama can feel goofy to an adult viewer, but its heart and earnestness—and the ambitious grabs it’s making at really big social and emotional topics that Disney has not traditionally embraced—easily make up for that. Following Paige and Frankie’s entry to Vuuugle (fake YouTube) HQ, Bizaardvark ends up being, like Austin & Ally and Sonny With a Chance before it, Disney’s take on a multicam workplace comedy—as in, the kids are completely in charge of their own professional lives, with no parents present save to reassure the viewer occasionally that the main characters aren’t feral. This also means that, unlike in Andi Mack, there is absolutely no drama to be had in this offering; it is pure oddball goofiness, sprinkled through with very silly but highly produced comedic music videos that would not be out of place in a queue alongside Rachel Bloom’s original YouTube work. Think CBS, but for deadpan Gen Z-ers who would appreciate the Bizaardvark team’s hatred of pranks, which are just (in Frankie’s words) a way to say “Ha ha, you had a completely normal human reaction to a situation we knew you would hate; YOU’RE DUMB.” But with songs! Before Andi, there was Riley Matthews (Rowan Blanchard) and Maya Hart (Sabrina Carpenter) and their very, very, very earnest adventures coming of age in New York City under the watchful eye of Corey and Topanga Matthews (Ben Savage and Danielle Fishel) of Boy Meets World notoriety—which is, obviously, the mainstream show this show was echoing. Girl Meets World ended its run January 20, but as with the fact of who was President at the time, it seems like long enough ago that a cast reunion ought to be imminent. But since episodes still run regularly on Disney Channel, the show is still fresh—give it a shot! Like Girl Meets World, Dove Cameron’s personal Freaky Friday vehicle Liv & Maddie wrapped earlier this year. Featuring Cameron as both Hollywood actress Liv and her twin sister, Maddie, a Wisconsin basketball star, this show has a classic TGIF feel, with just a hint of Orphan Black movie magic. Cameron is also the star of both Descendants DCOMs, and a singer in her own right. She is as likely to be the next Selena Gomez as any current Disney star, so you might as well get to know her formidable talents now so you can say you knew her when. I’m not the first to say it, but Raven-Symoné is the second coming of Lucille Ball. Great physical comedy is not nearly common enough, especially from women, and Raven commits. She was a revelation in her first series, That’s So Raven (her experience as a child actor may even put her ahead of Ball, tbh); she is a freaking miracle in this revival, in which she and her BFF Chelsea (Annaliese van der Pol) move in together to share both rent and parenting responsibilities for Raven’s twins, Booker (Isaac Ryan Brown) and Nia (Navia Ziraili Robinson, gunning for Selena Gomez’s “breaking while delivering lines” mantle), and Chelsea’s son, Levi (Jason Maybaum). Raven’s Home—which is, unlike the rest of its Disney neighbors, filmed in front of a live studio audience—has all the chaos, grotesquerie, and psychic visions of the original (with Booker now in on the latter), but with the added layer of a well-established friendship between thirtysomethings who have legitimate adult issues and experiences that adult members of the audience will find more than a little familiarity in. And while I want to say that this mature and critical observation is the top reason I love the revival so much, it is truly just that it—and especially Raven—is damn funny. Stuck in the Middle is Disney’s single-camera sitcom, operating like a cross between Lizzie McGuire (for style) and Saved by the Bell (for the protagonist’s stopping time to talk to the camera as things fall apart around her). It stars Jane the Virgin’s Teen Jane, Jenna Ortega, as Harley Diaz, middle child of seven, who has found her niche for both attracting and not attracting her family’s attention as an inventor. With so many characters in the family alone, every episode offers a fresh set of mixed and matched pairings, and the few outside characters that recur just compound that equation. As the often invisible glue holding the family together, Harley can offer insight into the social workings of any family that others might not have—but she can also be blinded by her own inclination towards self-sufficiency/tunnel vision. The fact that she loses the day as often as she saves it keeps the watch experience fresh, even as the repetitive chaos of the Diaz family is, itself, soothing. If Raven-Symoné is Lucille Ball’s second coming, Zendaya is Raven-Symoné’s—but as an activist. Wild multicam family spy ride K.C. Undercover is her second series under the mouse ears (the first was Shake it Up), and she is an executive producer on it, having worked with Disney, as she told Yara Shahidi, specifically to ensure there would be a black family on the network, and that her character’s portrayal would be accurate. The seriousness with which she approaches production, though, is matched by the commitment she puts into her physical comedy, which comes from a lower key register than Raven-Symoné’s, but is no less intense for it. K.C. Undercover isn’t the most important show you could be watching, but with an actual plot arc following through not just each season, but the whole series, it’s definitely better than so many other multicam sitcoms out in the world. It’s coming to an end next year, at which point Zendaya will be free to go save the world—catch her while you can.